How can I extract a line segment out of a polyline on the basis of numeric values (distances) defined as attributes [QGIS]? 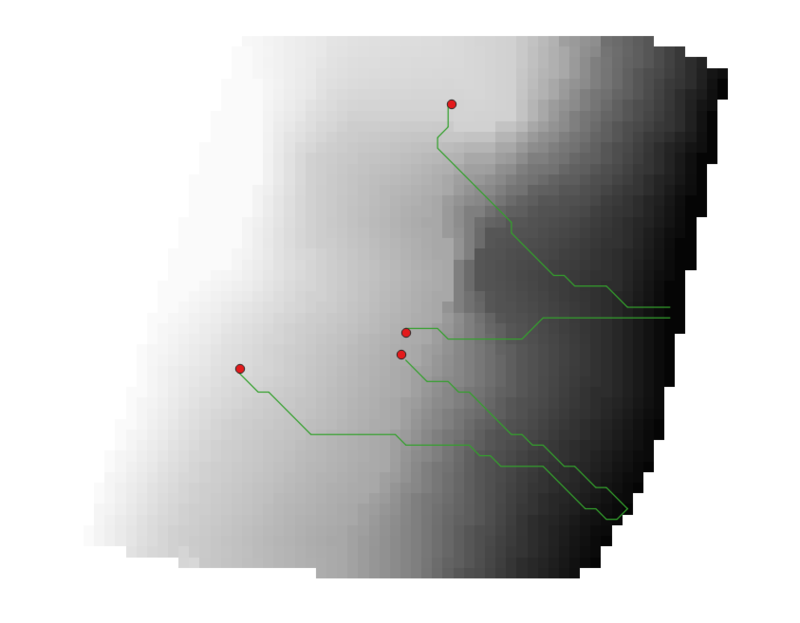 I have a set of points (red in the picture) in a shape-file containing an ID as well as two numeric values representing distances in Meters for each point. After creating polylines for each point via r.drain-GRASS-tool representing flow paths to the points (green in picture), I now need to extract a segment of each polyline that is between a distance A and a distance B from the corresponding point. So what I need is a shape-file containing a set of polylines, one polyline for each point that is between a distance A and distance B from the corresponding point. A and B vary between the different points. I tried creating two sets of buffers around the points, one for distance A and one for distance B and then afterwards use the vector overlay algorithms of QGIS but the buffers for different points may overlap and a line will then be clipped by the buffers of two different points. Is there a way to solve this problem with the buffers or even an easier way to do the extraction using QGIS(2.18 or 3)/GRASS? Oh, and it is not possible do it manually by editing the features, because I want to use it on a set of several hundred points. How to clip multiple rasters based on their overlapping area?